Delaware Arts Info: Art & the Beach...What Could Be Better? Francine is a Wilmingtonian whose passions include photography, theater, top-shelf tequila and a little guy named Finn. She lives in Bellefonte with her husband, Matt, and their Golden Retriever puppy, Finnegan. 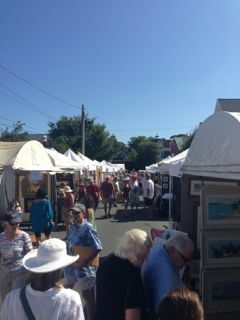 The St. Peter's Annual Art Show in Lewes is one of my favorite summer events. Every year, I look forward to this event, which is always held the first Saturday of July. Over 140 artists of every genre line the streets surrounding the historic St. Peter's Episcopal Church on Second Street. The folks at St. Peter's do a wonderful job selecting high-quality art and balancing the representation of various media via their juried selection process. The art on display is always beautiful, and collectors of all kinds can find something they covet. The 47th annual show was held this year on July 6, and my mother-in-law and I headed out early to beat the heat. The artists for whom jewelry is a medium always capture my attention, so we made sure to visit the booths of our perennial favorites, Joy Davis (http://www.delawarebyhand.org/davis) and Anna Biggs (http://www.annabiggsdesigns.com). I also found a new favorite whose designs I'm eyeing up for my collection — Moonflower Jewelry (www.moonflowerjewelry.net). Jen Brower of Moonflower creates intricate hand-woven silver pieces — think chain-mail as beautiful jewelry! As a budding hobby photographer, I was also taken by several photographers with stunning work on display. Gene Pembrook's travel photos (http://www.35slide.com) are breathtaking works that increased my wanderlust tenfold. I also loved Elisabeth Bard's nature photography (www.elisabethbard.com) — I found myself particularly taken with an intimate portrait of an angry Chickadee in the snow! I was equally impressed by Painterly Photography by Linda McAdams (www.lindamcadams.com), who has a unique technique of hand-altering Polaroids and transferring them to canvas for an Impressionistic effect. The colorful scenes by City Man were reminiscent of my beloved New Orleans, and the unique scenes and pet portraits by Mark Turner (www.markvturner.org) were captivating. If you've never been to the St. Peter's Art Show, I encourage you to visit next year (July 5, 2014). If you go, be sure you come hungry because the famous turkey salad croissant lunch prepared by the ladies of the church is also something to look forward to each year! Crystal Decanters - Welcome to Badash Crystal, your online retail shop for crystal candle holders, scotch decanters, paperweights, crystal stemware, glass goblets and glass cylinder vases.